FILE - Cameroon soldiers check a truck on the border between Cameroon and Nigeria as they combat militants, including Boko Haram, Feb. 19, 2015. Cameroon has closed its border with Nigeria in the north, after a series of attacks by Boko Haram militants on Cameroonian ranchers. The closure is meant to protect the ranchers' cattle, but it is hurting the ranchers' business. Hundreds of ranchers have brought their cattle and livestock to the Bogo market on Cameroon's northern border with Nigeria. According to Cameroon's government, this market is the supply point for most of the cattle sold across the border. But cattle rancher and seller Ahminou Ngomna says he has not seen his Nigerian customers since September. Business usually booms with the approach of the Christmas and New Year feasts, but that is not the case now. Only customers from Maroua in northern Cameroon have been buying from the market, and the amount they pay per cattle is not up to what Nigerian buyers pay, Ngomna said. The price per cow, which ranges from $500 to $1,000 depending on size and weight, has fallen to as little as $250. 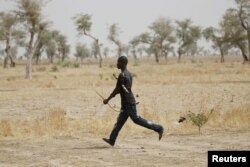 FILE - A member of a civilian vigilante group carries a bow and arrow while running on patrol with the Cameroonian military in Kerawa, Cameroon, March 16, 2016. Kerawa is on the border with Nigeria and is subject to frequent Boko Haram attacks. Hamidou Bouba, first deputy mayor of Bogo, says the prices started dropping when Cameroon's government ordered the closure of parts of the border with Nigeria. The move was made because Boko Haram attacks on farmers and cattle ranchers, which had fallen since January, increased in September with armed men crossing the border for supplies. "We are suffering very badly about this situation of Boko Haram," Bouba said. "That is the reason why all the traders cannot go to Nigeria now. We changed their direction, moving their activities to Douala or Yaounde. That is the only solution. I think that we don't have another solution." Bouba says the ranchers are encouraged to transport their cattle some 70 kilometers from the affected zones to the nearest market, because even buyers from the hinterlands of Cameroon are refusing to travel to Bogo. Cattle ranchers and farmers comprise 80 percent of the population of the border areas. Cameroon reports that more than 100,000 have relocated due to the Boko Haram insurgency; others live in abject poverty. Louis Paul Motaze, Cameroon's economy minister, says the government will build new markets in safer areas. "People here are suffering a lot not only because of the war with Boko Haram, but because of poverty," Motaze. "This is why we would like to take into consideration another battle, and this battle is the battle for development." The Boko Haram insurgency, which began in northeast Nigeria eight years ago, has left at least 25,000 people dead and forced more than 2.6 million others to flee their homes, according to the United Nations.